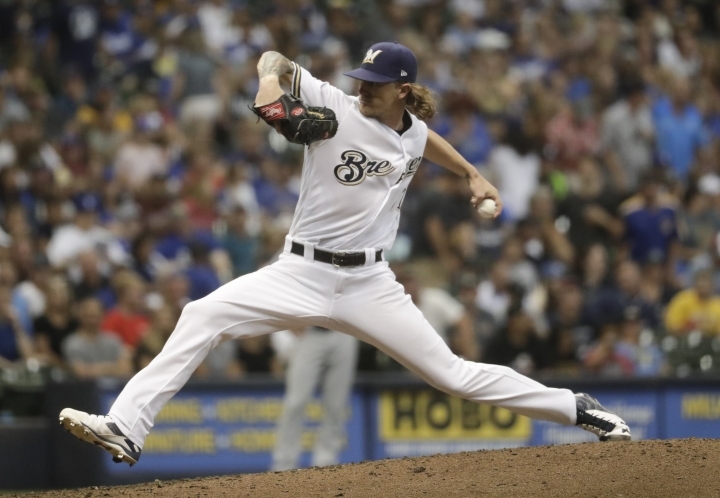 MILWAUKEE — Milwaukee Brewers reliever Josh Hader has received a warm ovation from fans in his first appearance on the mound since his years-old racist and homophobic tweets surfaced during the All-Star Game. The left-hander jogged in from the bullpen after the Brewers scored three runs in the bottom of the sixth to take a 4-2 lead over the Los Angeles Dodgers. He took a few warmup tosses before being introduced by the public address announcer. Most of the more than 36,000 fans attending in attendance were applauding after he was introduced, with many fans standing at Miller Park. Hader struck out pinch-hitter Logan Forsythe for the first out in the seventh. He allowed a two-out double to Matt Kemp before getting out of the inning when cleanup hitter Max Muncy lined out to first.